So, things have been a little crazy around here the past couple days. Aiden somehow managed to get pink eye even though he doesn't go to daycare and is hardly ever around children I don't know. At the same time, I managed to get the worst sinus infection EVER. But, we both went to the doctor's yesterday, got some meds, and today was a MUCH better day. Needless to say, Rob and I didn't get as much done outside this weekend as we had hoped. But, he did finish the pea gravel area that I was explaining in my last post. Actually, this was a pretty big project and the difference is huge! That area was so ugly before I didn't even want to take pictures. I have hated that area since we moved in. He dug up all the old slate and concrete, leveled it out, and put down landscaping fabric with the pea gravel over top. I love how it looks. We did manage to make a trip to Ikea where we picked up a couple more of those planters which we will plant something tall and grassy in to hide the broken up concrete behind them. Every time we go to Ikea, we have to hit up the "As is" room. Rob immediately spotted this HUGE planter that was only $10 because it had a small dent in the rim. He claims they are normally like $60 and was so excited about this find, there was no way to even try talking him out of it. The thing is almost as tall as Aiden. He's been brainstorming about what to do with it. My favorite idea is making it into a fountain with rocks inside. We can picture Aiden putting his little hands in it to cool off on hot summer days. We won't get much done this weekend because Rob is heading up to Maine with his Dad to open up the cabin. But I may try and spraypaint some pots, clean up my window boxes out front, things of that nature. Then hopefully next weekend Rob can powerwash the concrete patio and we can work on staining the deck. 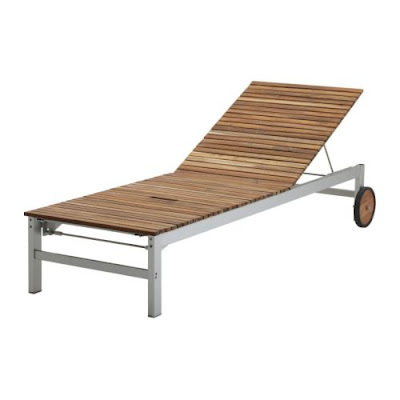 And lastly, I have decided I want this chaise from IKEA. I saw it online and was hesitant about whether it would be made well but we checked it out at the store and it seems to be sturdy. Plus, it can also lay flat like a bench for extra seating when entertaining. And $150 isn't a terrible price.